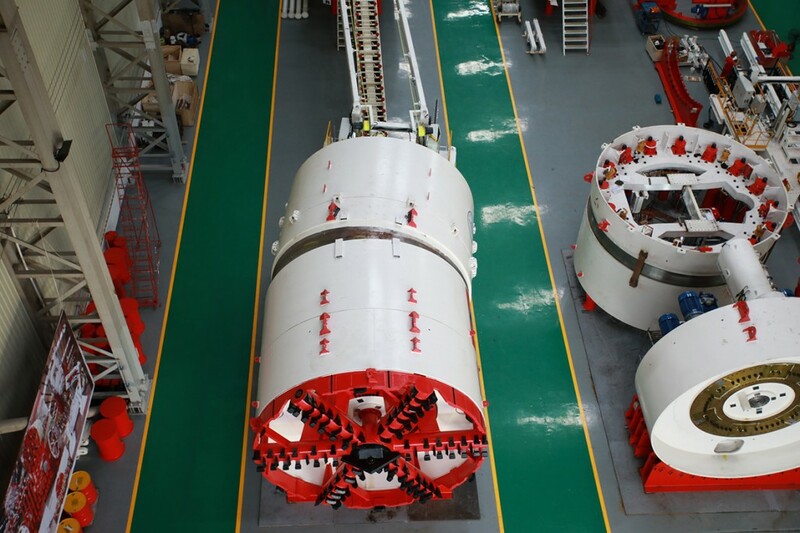 In April 2017, TERRATEC celebrated the successful Factory Acceptance Tests of two new 5.7m diameter tight radius EPBMs destined for the Bueng Nong Bon to Chao Phraya River Diversion Tunnel Project, in Bangkok, Thailand. The ceremonies were attended by representatives of the Bangkok Metropolitan Administration (BMA) and Thai contractor Sino-Thai Engineering & Construction Public Company Limited (STECON). Located in the south-east of Bangkok, the 9.2km long Bueng Nong Bon to Chao Phraya River Diversion Project is the third of four major flood prevention tunnels to be built under the BMA’s long-term plan to manage the severe flash floods that currently plague the Thai capital during the rainy season. Due to the densely developed nature of the city, the east-west route between the Bueng Nong Bon reservoir and the Chao Phraya River has largely been dictated by the need to stay within public road easements, which has imposed a number of very tight radius curves on the tunnel alignment. To achieve these, the TERRATEC Tight Radius Shield (TRS) machines have been designed with an extreme X-type articulation system that provides a maximum articulation angle of 7.5-degrees to accommodate a minimum radius curve of 35m. The first machine to get going on the project will be the S54 machine, which will be launched into a 65m radius curve – from a 15m diameter shaft at the Bueng Nong Bon reservoir intake – southwards towards the Klong Nong Bon Inlet Station. Following an intermediate breakthrough at Klong Nong Bon, the TBM will then be turned 90 degrees within the 12m diameter shaft and re-launched westwards to the Klong Kled Inlet. The third and final run for the S54 machine will require a sharp 40m radius curve mid-drive to turn the TBM northwards to the Sukhumvit 101/1 Shaft, where the TBM will be dismantled. The total length of this first section is 5,523m. Meanwhile, the S55 machine will complete the two remaining sections of the tunnel. 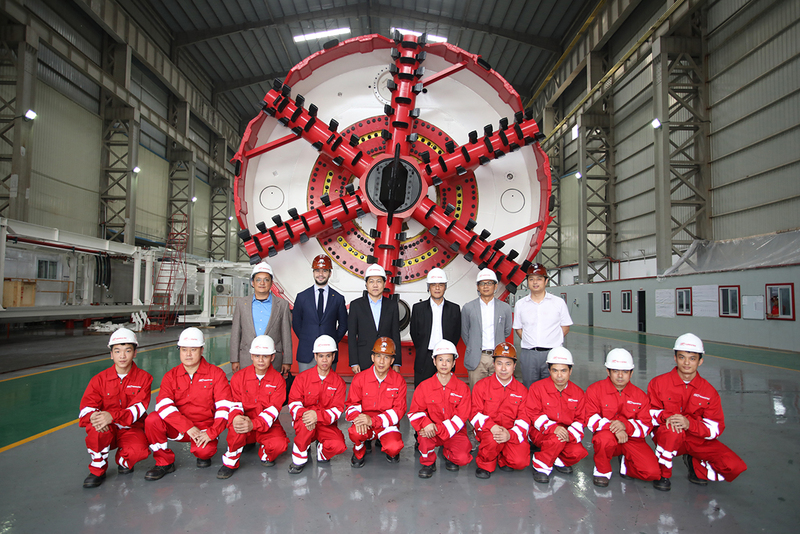 Launching from the 15m diameter Bang Aor Pump Station (Inlet) Shaft – which, along with the Bang Aor Pump Station (Outlet) Shaft, has been constructed within a large diaphragm wall groundwater cut-off structure – this TBM will also commence its 2,975m drive with a 65m radius curve, heading eastwards to the Sukhumvit 66/1 Inlet Shaft. Here, the machine will need to negotiate a challenging, double 40m radius, S-shaped spiral curve before completing its drive to the Sukhumvit 101/1 Shaft, where it will be dismantled and transported back to the Bang Aor Pump Station (Outlet) Shaft. 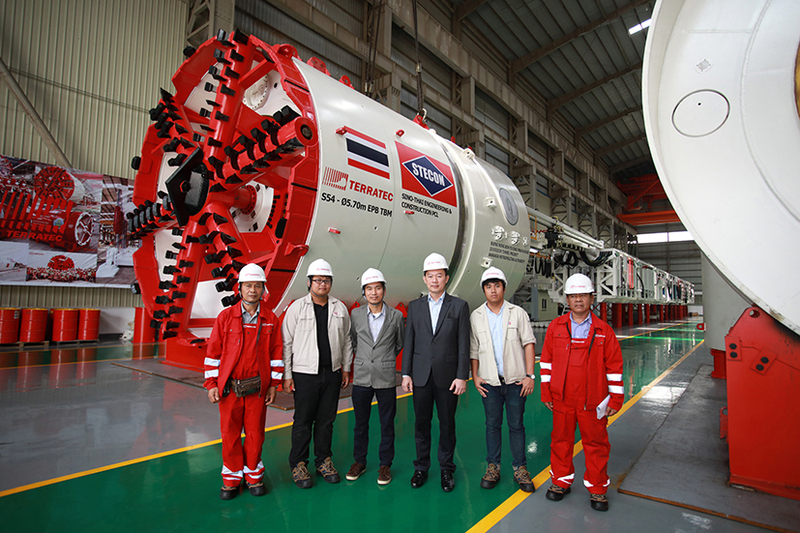 Following reassembly, the S55 machine will complete a final 690m drive westwards from the Bang Aor Pump Station (Outlet) Shaft – again starting on a 65m radius curve – to the Chao Phraya River Outlet Shaft. Geological conditions along the alignment consist of soft to medium sandy clays, stiff clays and very dense sands, with an average overburden of 30m and a maximum groundwater head of about 1.5 bar. The TBMs’ soft ground cutterheads feature an open spoke design with the addition of knife bits to assist break-in and break-out of the shafts. Traditionally reinforced 1.2m thick, 5m internal diameter, precast concrete segments will typically be installed as the machines progress, with shorter steel segments utilised during the course of the sharp 40m radius curves. 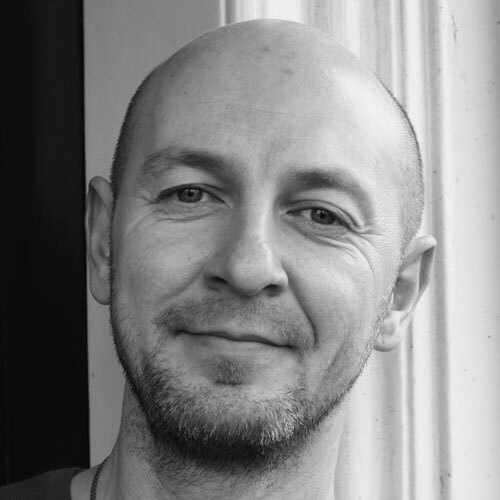 Following their successful factory acceptance tests, the machines will now be shipped to Thailand, with excavation due to commence later this year. Machine operation will be assisted at all times by TERRATEC’s highly-experienced Field Service staff, providing quality after sales support to ensure optimum performance and successful project completion. When complete, the tunnel will have a drainage capacity of 60 cubic metres per second, providing much needed flood relief to an area of approximately 85 square kilometres.